Living in the Nordic Countries is an interactive educational programme on the subject of architecture for young people between 13 and 16 years of age in secondary schools in Denmark, Finland, Iceland, Norway and Sweden. The Internet-based 2-week course allows school classes to work together on architecture throughout the Nordic countries, the starting point being each student's own dwelling and its surrounding neighbourhood. The course is designed as a multimedia programme and the goal is to create a brand new concept for education that, with the use of the Internet, provides a platform where students can work interactively with students in other Nordic countries. Through the dialogue in 'neighbouring languages', social curiosity develops about investigating and exchanging cultural diversity and similarity. To encourage students to take an interest in architectural design and quality, based on their local environment. To provide students with the opportunity to work actively with digital media. To use the Internet in promoting communication between students across national boundaries. The disciplines of the course include writing, photographing, drawing, model making as well as the more implicit disciplines of teamwork and communicating via the Internet. The wide-ranging subject of architecture is ideal for covering the general curriculum in Nordic schools. 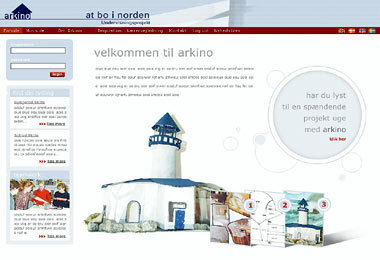 The project concept was generated by a group of media professionals and architects in the summer of 1999, since when the group has established a broader network of Nordic consultants and working partners within the educational system, teaching institutions and professional architectural organisations and firms. Living in the Nordic Countries is a non-profit project and the development was initiated with a grant from the Nordic Council of Ministers in 1999. Arkino is not affiliated with any institutions or companies. The programme was tested in 2001 in schools in Norway, Finland and Denmark and the current work is based on our experiences from this successful test. The project is in the final phase of development and has received funding from several Danish and European foundations. The current development phase will result in a final specification on the web part of the programme by about October 1, 2003. Arkino is currently seeking additional funding to enable the start of the web programming and subsequently launch the programme as scheduled in the summer of 2004. My aim for future work with architecture and education is to develop tools and materials for teachers in order to make it possible to include architecture in the daily teaching routine of primary and secondary schools.